I acquired an old leaded-glass window by way of my parents, and quickly destroyed it. Actually, several of the panes were already cracked, the window was warped, and the frame was rotten and crumbling. But the part where the entire assembly fell off the mantle, cracking a few more panes, dislodging several entirely, and destroying the frame - that was all me. No matter. It's been re-purposed as a mirror and has a nice home now on our living room wall. I used Krylon's Looking Glass paint to turn the window into a "mirror" of sorts - it's shiny and reflective, but not in the way a brand-new mirror would be; rather, it's cloudy and antique-looking. I actually rather love the effect. Read on for instructions on achieving the effect and hanging the cumbersome, unwieldy thing on your wall. I simply cleaned the back (unbeveled) side of the window well with soap, water, and Windex - and I left some of the black cloudiness that it had acquired from years spent sitting in a shed. The instructions on the Looking Glass paint are to give the item several very light coats of paint. I taped off the frame (which became moot in the end), and laid it out in the yard. In order to get an irregular, antiqued effect, I first spritzed the glass with a light spray of water, then sprayed on my first and second coats of paint. I spritzed again before applying the third and fourth, and then the fifth and sixth coats of paint. This lends a mottled look to the silvered surface. Post-painting, the glass still has a good bit of translucency, but only when it's set right in front of something. From the back - the side you painted - it will still look almost transparent. The window's plummet to the floor took care of removing the rotting frame for me, but it would have been easy enough to remove otherwise - the glass was held in by just a few wayward nails and some crumbling glazing compound. I struggled for two hours one night, desperately reinserting the panes that had removed themselves in the crash. The window came out the worse for wear, but I like to think of it as rustic. We have picture moldings in our living room, so I used these to hang the mirror. This system would work just as well using screws or hooks in the wall - but I would try to located at least two of the screws on studs, as the glass is surprisingly weighty. Attaching strings to the mirror itself was the really tricky part, but hardware-store-bought picture molding hooks did the trick. I manipulated nine of these hooks with pliers, smushing down the bottom (the part that holds the wire) completely, and the top (the part that hooks onto the rail) a little. The top part would now hook over the mirror, and the bottom part was out of the way (you could cut it instead, if you're so inclined). I put five of these at the bottom of the mirror, and looped twine through the hole on the hook. I put the other four hooks on the top of the mirror, gluing them lightly in place with hot glue. I ran the twine through the holes on these, too. These top hooks keep the mirror from pitching forward. In the end, I had two discrete twine systems - one length runs from the bottom-left corner of the mirror, up to the molding, down to the bottom-center of the mirror, up to the molding again, and back down to the bottom-right corner of the mirror - like a double camel's hump. This length of twine was secured by a hook whenever it passed the top of the mirror. The other length of string went from the mid-left-bottom of the mirror, to the molding, then down to the middle-right of the mirror - a single hump. The length is unsecured at the top - it just serves to take some of the mirror's weight off the first length. The important thing about the top hooks is that they should be "floating" - the string shouldn't be tied to the top hooks, so that they stay clipped to the mirror no matter what the string is up to. I found out, when working at this, that the Looking Glass paint rubs and scratches off very easily, so be careful when handling your finished mirror. Give a cool, old window some new life! But try not to nearly kill it first. So awesome. Such great shapes. WHAT A GREAT IDEA! I collect old windows and spend a fortch having mirror panes installed. This idea is way better! Will give it a go. So cool, what a great piece to inherit! I know, blonde! I was only too happy to pull this out of my parents' shed. I feel terrible about the damage I inflicted on it, but it turned out great, and gets a lot more love now. Jennygen - like I said, the Looking Glass paint doesn't give an exactly mirror-like finish, but it comes close - especially if you'll clean the glass really well first, which I didn't. If you want an antique look, I bet you'd like it! Let me know if you try it. What a brilliant idea! Thanks so much for the in-depth instructions. I'm definitely going to try this! Wow, that's great!! I can't wait ti try this paint!! Beautiful! Love the looking glass mirror paint and this is another prime example of what it can do! Such a unique piece! I saw this on design*sponge and I must say I was mightily impressed. I am also pretty smitten by your clever and beautiful infographic explaining the hanging process! This is an excellent project! I love it and we have some pretty excellent access to old vintage windows and such. I might have to give this a try. This is stunning! Now I have to be on the lookout for an old window. Thanks for the inspiration! Wow! This is awesome! Congrats on finishing such a cool project! 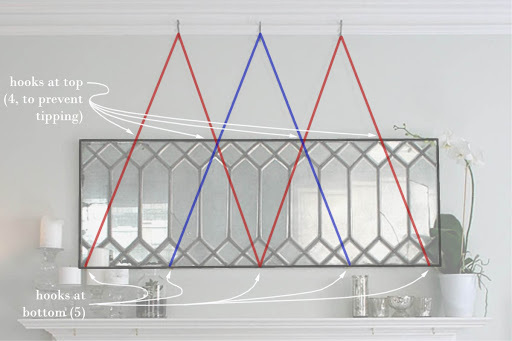 paste a piece of wall-colored paper behind the frame of the mirror so that it isn't at all visible from the front and that way you won't run into the problem of the paint smudging. What a clever way to make such a unique mirror! Stunning! This is so gorgeous and such an insane coincidence.... I just walked past a similar gorgeous window at a thrift shop (4 of them in fact) and passed them up! Ack! I hope they are there tomorrow!!! :D Great work! Melissa - I wish I had access to vintage windows! How'd you swing that? Jackie - snap one up! I think this would work great on a covered porch or in a dining room over a sideboard, too. This is awesome!! I have some old windows from my house that I had changed out and would love to make them sort of antique looking mirrors. What a neat idea-thanks!!!! Amazing project! I'm going to have to watch for an old window now. Thanks for sharing. I think I love you! Seriously, this knocks my socks off. I am your mother and you are my favorite child. This is beautiful! Where did you find the spray paint? Do most hardware stores carry it? This is absolutely gorgeous. I want one! Joanna - sorry for the late reply! I haven't seen this stuff at hardware stores. I bought mine at Sam Flax, a big art supply store here in Atlanta, and I'd bet that Michael's carries it. It's also online. Thanks, everybody, for the comments! Thanks for the idea. We replaced some of the decorative leaded glass windows in our house. I couldn't bring myself to get rid of them so they've been sitting in my basement while I tried to think of something to do with them. I knew being a pack rat would pay off eventually! Found your mirror project on Better After and LOVE IT!!! Amazing look! How beautiful! I use Krylon paint all the time but I've not seen the Looking Glass paint. Thank you for giving this wonderful tutorial! Oh my gosh - I have the EXACT same window! It was left in an attic in an apartment I lived in last year and I took it when I moved, sneaky, I know. It's been sitting in the garage waiting to be loved and now it will be! Yours looks really stunning, it's perfect, what a great idea to rescue it. I am going to share it with you when I do it for sure! I'm drooling over your fireplace -- did you do it? The surround is very similar to ours (except ours is still the yucky oak. But I can't tell what the inside is -- is it tile or stone or brick? Could you give me some insights? Hi Laura! The fireplace, like our lovely wood floors, is something that the previous owners did really well. I love the tile surround! (Allen thinks the tiles are too small.) I'm pretty sure that the wood mantlepiece is original to the house - 1940's. The back of the fireplace is just gray brick, with a finish a bit like cinderblocks. I actually really like it; it's utilitarian and sort of fades into the background. But your mentioning that makes me remember that we need to call a chimney sweep! this is great! I just bought an old window tonight and I'm going to try this out tomorrow! Thanks for the idea! nice looking paint design.i will try for my kitchen window. I've seen some cool things done with old windows, but never heard of looking glass paint before. This is awesome! I have a cool old window that I picked up off the curb and I am SOOOO glad that I haven't done anything to it yet. This is the absolute best diy with an old window I've seen yet....and I've looked at a LOT. Thank you so much for sharing this! I hate to bother you, but I have had this pinned on pinterest for quite awhile. I have a question that is not related to the window. I actually love the tile around the fireplace and was wondering if you had a source for it. I have some hideous and cracked black marble around mine and was hoping to redo it sometime soon. Thanks!! Love this! How did you make sure not to paint over the leaded (metal edges)? Thanks! I've been meaning to try something similar with your hanging technique on a stained glass window that I can't bear to paint. But, how did you manage to reinsert the panes of glass that fell out? this is beautiful, thanks for the how to as well as the inspiration! Would this work on an etched glass window? Once I thought about things like: why such information is for free here? Because when you write a book then at least on selling a book you get a percentage. Thank you and good luck on informing people more about it! This was very inspirational! I absolutely LOVE what you did, and I will definitely remember your project if I ever come across one of these windows. I used the same Looking Glass Spray to make centerpieces for a party when I was on a serious budget. I bought basic but beautiful clear round globe vases with a rippled edge at the dollar store- but then I sprayed the insides with this paint, and placed silk flowers and feathers inside. People though they were so expensive and when I let everyone who helped with the party take one home they thought it was such a luxury when really I had managed to make 8 centerpieces for under $30. Absolutely adore that product!